Relationship(s): nephew of Vladimir Guerrero cousin of Vladimir Guerrero Jr.
Is the nephew of former Major League players Vladimir Guerrero (HOF) and Wilton Guerrero, and a cousin to Vladimir Guerrero Jr. Spent most of season with Triple-A Louisville (104 games) in Reds' system. Began year with Double-A Pensacola (26 games) and finished it with first MLB call-up (14 games)...Hit .296 (29x98) with 12 extra-base hits, 16 RBI, and eight multihit games with Pensacola; promoted to Bats on May 7...Tallied 43 multi-hit contests in 130 games in the Minors, including eight three-hit games and three four-hit games...Hit .292 (118x404), with 64 runs, 15 doubles, four triples, 17 home runs, and 65 RBI for Louisville...Hit .412 (21x51) over final 12 games with Bats, with 10 RBI, and had contract selected by Reds on September 4...Played 88 games (87 starts) in right field in the Minors, posting 10 assists; also had 40 appearances (38 starts) in center field, with five assists...The 15 total assists tied a career high (also, 2015)...Brought his career total for outfield assists in Minors to 88: 65 in right field, 20 in center, and three in left...Made Major League debut that night at Pittsburgh and struck out in a pinch-hit appearance...Picked up first MLB hit in fifth game, going 1x3 on September 11 vs. the Dodgers...First MLB homer came as pinch hitter on Sept. 22 at Miami (Nick Wittgren); was Cincinnati's only run in 5-1 loss...Played in Dominican Winter League with Estrellas Orientales. Went 1x7 over first two games before recording a 10-game hitting streak, posting a .326 (14x43) average with four multi-hit games, three doubles, two homers and seven RBI...Finished winter campaign with .272 average (28x103), 12 runs, six doubles, three homers, and 12 RBI. Spent the season at Class AA Pensacola, where at the Southern League All-Star Game he was crowned Home Run Derby champion (29hr)...his 137 hits were a single-season franchise record, fifth-most in the Southern League...also ranked among the Southern League leaders in at bats (4th)...attended his first Major League spring training camp...in 16 exhibition apps hit .304 (23 2b, 4rbi)...played for Orientales in the Dominican Winter League (40g, .287, 7 2b, 4hr, 26rbi, 3sb). Entered the season rated the Diamondbacks' eighth-best prospect by Baseball America and 11th-best prospect by MLB.com...in 126 apps for Class AA Mobile and Class AAA Reno produced 38 extra-base hits and 54 RBI...following the season played for Estrellas in the Dominican Winter League (33g, .250, 6 2b, 1hr, 16rbi, 1sb)...on 11/18 was designated for assignment...on 11/28 was claimed off waivers by the Reds...on 12/2 was non-tendered and became a free agent but a week later was re-signed by the Reds to a minor league contract and invited to 2017 Major League spring training camp. Appeared in 126 games between Double-A Jackson (Mariners) and Double-A Mobile (D-backs), hitting .222 (102-for-460) with 25 doubles, 7 homers and 47 RBI…Acquired from Seattle on June 3, with C Welington Castillo, RHP Dominic Leone and INF Jack Reinheimer for OF Mark Trumbo and LHP Vidal Nuño…Hit .300 (15-for-50) with 2 homers and 4 RBI in 13 games with Salt River in the Arizona Fall League…Entered the season ranked by Baseball America as the Mariners' No. 7 prospect. December 11, 2018 Estrellas Orientales placed OF Gabriel Guerrero on the reserve list. 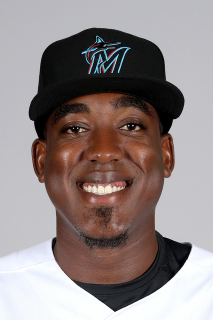 December 3, 2018 Miami Marlins signed free agent RF Gabriel Guerrero to a minor league contract and invited him to spring training. December 3, 2018 RF Gabriel Guerrero assigned to New Orleans Baby Cakes. November 2, 2018 RF Gabriel Guerrero elected free agency. October 15, 2018 OF Gabriel Guerrero assigned to Estrellas Orientales. October 8, 2018 Estrellas Orientales placed OF Gabriel Guerrero on the reserve list. October 3, 2018 Cincinnati Reds sent RF Gabriel Guerrero outright to Louisville Bats. September 4, 2018 Cincinnati Reds selected the contract of RF Gabriel Guerrero from Louisville Bats. May 7, 2018 RF Gabriel Guerrero assigned to Louisville Bats from Pensacola Blue Wahoos. May 5, 2018 Pensacola Blue Wahoos activated CF Gabriel Guerrero from the temporarily inactive list. May 2, 2018 Pensacola Blue Wahoos placed CF Gabriel Guerrero on the temporarily inactive list. March 7, 2018 OF Gabby Guerrero assigned to Cincinnati Reds. April 6, 2017 CF Gabriel Guerrero assigned to Pensacola Blue Wahoos from Louisville Bats. December 20, 2016 RF Gabriel Guerrero assigned to Louisville Bats. December 3, 2016 Cincinnati Reds signed free agent RF Gabriel Guerrero to a minor league contract and invited him to spring training. December 2, 2016 RF Gabriel Guerrero elected free agency. November 28, 2016 Cincinnati Reds claimed RF Gabriel Guerrero off waivers from Arizona Diamondbacks. November 18, 2016 Arizona Diamondbacks designated RF Gabriel Guerrero for assignment. October 20, 2016 OF Gabriel Guerrero assigned to Estrellas Orientales. October 3, 2016 Arizona Diamondbacks recalled RF Gabriel Guerrero from Jackson Generals. August 6, 2016 Gabriel Guerrero assigned to Mobile BayBears from Reno Aces. June 25, 2016 RF Gabriel Guerrero assigned to Reno Aces from Mobile BayBears. March 21, 2016 Arizona Diamondbacks optioned RF Gabriel Guerrero to Mobile BayBears. November 20, 2015 Arizona Diamondbacks selected the contract of Gabriel Guerrero from Mobile BayBears. June 4, 2015 RF Gabby Guerrero assigned to Mobile BayBears. April 7, 2015 RF Gabby Guerrero assigned to Jackson Generals from Bakersfield Blaze. March 7, 2015 RF Gabby Guerrero assigned to Seattle Mariners. April 1, 2014 Gabby Guerrero assigned to High Desert Mavericks from Clinton LumberKings. March 22, 2014 RF Gabriel Guerrero assigned to Seattle Mariners. April 3, 2013 RF Gabriel Guerrero assigned to Clinton LumberKings from AZL Mariners. August 6, 2012 Gabriel Guerrero assigned to AZL Mariners from DSL Mariners. March 9, 2011 Gabriel Guerrero assigned to DSL Mariners. January 13, 2011 Seattle Mariners signed free agent OF Gabby Guerrero to a minor league contract.